Dymond Hitec 2.4 - 8 channel receiver. This receiver has been designed to be a compatible equivalent of the Hitec Minima line of receivers but with an increased specification. 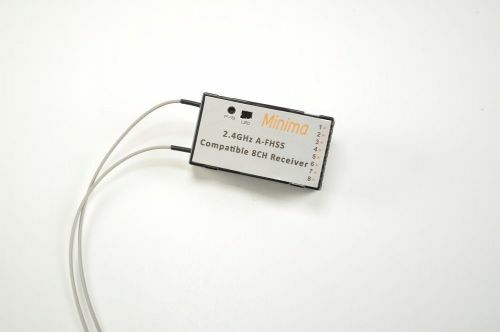 As this is compatible with the Minima line of receivers, please ensure that your Hitec 2.4GHz transmitter and/or module support the ability to connect to Minima receivers. For most units, it is likely they have this ability.However for older units, if not already done so,they may need their software updating to support it.